This is Fernando Trujillo's professional English web site. You can find everything related to his teaching at the Faculty of Education and Humanities. 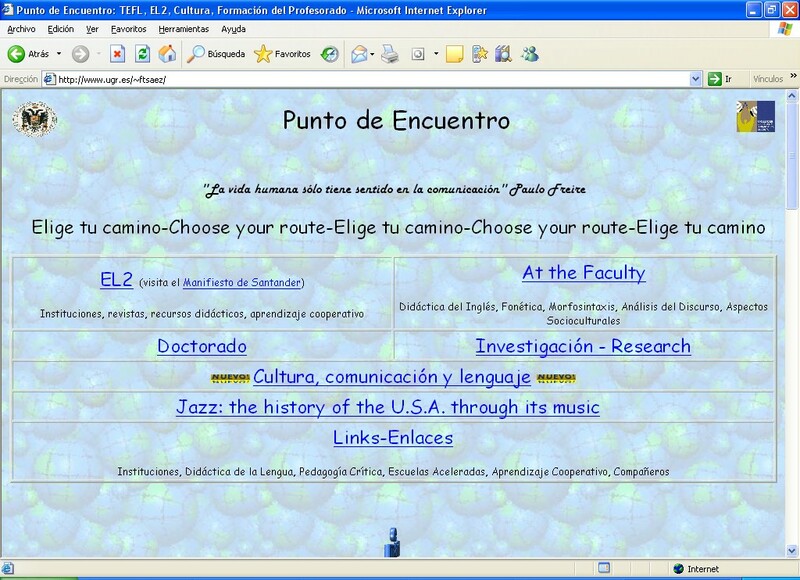 The first version of this website was released on February, 17, 2002 and was redesigned in July 2006.
e-lecture is the electronic version of my lectures at the Faculty of Education and Humanities of Ceuta (University of Granada-Spain). Feel free to browse around it and get whatever you may need. You can also check my main personal web site, fernandotrujillo.com, and my blogs: De estranjis (Spanish as a New Language at School) and Otras lenguas (Teaching Foreign Languages). This web site aims to be a contact point between my students and me. It includes all the electronic materials I use at my lectures and some other resources for language learning and teacher training. The Internet is full with useful resources to help you learn. At every section you may find links listed and described but, why don't you start checking these ones out? Copyright © 2006 Fernando Trujillo | E-mail: ftsaez@ugr.es | Design by Andreas Viklund adapted by Fernando Trujillo.